The pain of rising from a comfortable couch to get a beer from the fridge is one we all know. Yet, as with a growing number of modern inconveniences, artificial intelligence may be coming to the rescue. Footage posted online by Homer, a research group at Germany’s Institute of Computational Visualistics, shows a robot taking an order from one of the team before making the short journey to a fridge in a breakroom. The Tiago robot, built by Barcelona robotics firm PAL, was connected to an NVIDIA laptop as the team's submission to a competition for AI developers. Employing a winding mechanical arm, the robot opens the fridge door before identifying the technician’s chosen beer from a range available inside. After clumsily removing a can, and very nearly knocking another bottle off its shelf, it then closes the door and returns to the technician. The project was submitted to a competition run by US tech firm NVIDIA which offered $10,000 to the best project built using one of its AI development applications. 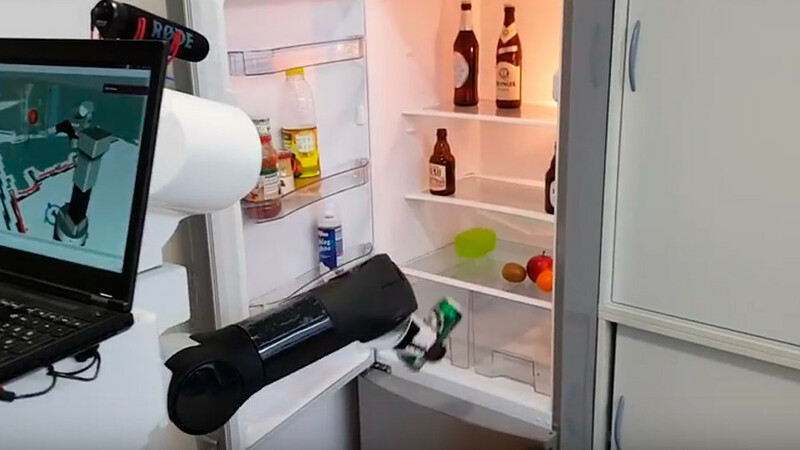 The video shows how segmentation of objects using the firm’s Jetson TX2 software allows the AI to identify the handle of the fridge and determine which is the right beer. For those whose only source of exercise is that short walk from couch to kitchen, it’s difficult to know whether the robot’s beer-fetching is good news or if it will become a high-tech enabler. One thing is for sure, the software will need to be better implemented if it is to be a worthwhile addition to even the laziest of households.